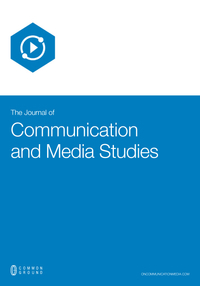 The Journal of Communication and Media Studies offers an interdisciplinary forum for the discussion of the role of the media and communications in society. The journal explores everyday experiences of media cultures, the forms and effects of technologies of media and communications, and the dynamics of media business. It also addresses media literacies, including capacities to “read” and “use” the media, and the role of media as a key component in formal and informal learning. Contributions to the journal range from broad, theoretical conceptualizations of media to detailed empirical examinations and case studies of media practices. The Journal of Communication and Media Studies is s a peer-reviewed, scholarly journal using a two-way anonymous peer review model. Reviewers are active participants of the Communication and Media Studies Research Network or a thematically related Research Network. The publisher, editors, reviewers, and authors all agree upon the following standards of expected ethical behavior, which are based on the Committee on Publication Ethics (COPE) Codes of Conduct and Best Practice Guidelines. The Journal of Communication and Media Studies currently has a 16% acceptance rate, based on 2017 statistics. Review scores are based on a clearly articulated rubric, and the result is a peer-review process that is scrupulously fair in its assessments, while at the same time offering carefully structured and constructive feedback that enhances the quality of the published article. Each year a top-ranked article from The Journal of Communication and Media Studies receives the International Award for Excellence. Reviewers are selected on the basis of subject matter and disciplinary expertise. All review scores are based on clearly articulated criteria, leading to fairer and more precise feedback.